Pardon me for combining these two compilations into one post, but my time is limited and I wanted everyone to be aware of these. 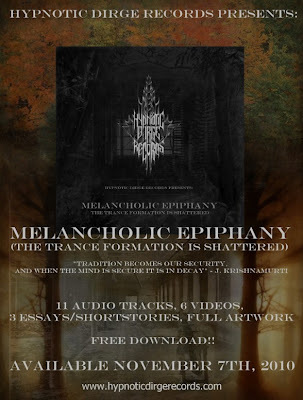 First, a MASSIVE compilation is available for free download from Hypnotic Dirge Records, one of the finest labels for dark music of various sorts (notably, ambient and metal). This features audio, video and text files, which explains the rather considerable size of the download. It is their second annual compilation download, and we can only hope that this continues to be an annual project, because both are great. Get the latest one here. You see why I said "massive," right? Second, the good folks over at Meteor City (the same people that bring you the All that is Heavy distro) have made available their double CD compilation available for free download. A total of 20 heavy tracks from stoner-rock and doom favorites such as Black Pyramid, Farflung, and others. Get it here. You've got to love it when labels are kind enough to give something back, so always keep these guys in mind. Enjoy!